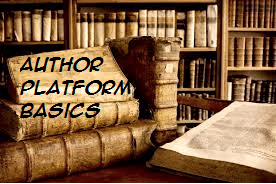 I have created the outline below to help writers figure out what an author platform is and how it can help them sell books. I’m in a lot of writer groups on Facebook and I am fairly active on Twitter. Not because I have too much time, but because most of the time I am building my platform if I am not working, writing, or editing. I believe in author platforms and I think that if more writers had them they’d be more successful in self publishing. If you look around you will see a lot of writers that don’t have platforms and don’t know why their books aren’t selling. I’ve reached out to multiple indie authors to get to know them and learn about how they have built their platforms for selling more books. I believe that there are three essential parts of a platform that you should be building before, during, and after you write your first book and every book there after. Those parts are Blog, Social Media, and Email list. They are all simple and easy to grow over time. The main thing that slows people down, or reduces adoption of these mediums is that they take so much time to grow. In a week you won’t see a huge spike in anything because of your actions on social media, blogging, or emailing. These things take time. Month over month you grow and as your network grows more people know about you and more people are exposed to your work. You are a writer. So write. I have this blog. I write about writing and I share the things that I am learning about self publishing and platform building. Because I am releasing cosmic horror soon I talk about horror and cosmic horror quite often on here as well. This is both for keywords and SEO but also because I want to attract readers who are interested in those things. I want to help writers to grow my group of friends in their field and I want to talk about horror and books to attract readers. You should write about what your books audience would want to read. Writing a quick blog post twice a week shouldn’t take you any more than a half hour. See what works, what drives traffic, and make more of that kind of content. This can also help to show you if people are as interested in the things you want to write about as you think they will be. You will be sharing your blog posts on social media. I focus on Twitter and Facebook. I pretty much ignore Instagram because books are not pictures and I don’t have the time to make all that extra content. Using a Facebook author page gives you more exposure to your audience on the medium and gives you something to share into groups with your blog posts. Instead of sharing just a blog post, you can share your author page post into the group giving you the opportunity to gain more followers as you share your articles on Facebook. Twitter, to me, is the best social media for books. I say this because I have had the most success with it and because I get about half my web traffic to my author website from twitter alone. I have used twitter to connect with other writers. I’ve interviewed a few of them here. I like twitter because I use Crowdfire to automate my account posts and realistically I only get on to follow other authors or readers and interact with people posting about Hashtags I’m interested in. I’d like to note that GoodReads lets you reach out to people using their social media integration and invite them to be your friends on GoodReads. So my 9,000 twitter followers have almost all gotten an invite to be my friend on GoodReads too! Where I am admittedly not very active. Email lists are insanely valuable. Some people don’t use Facebook. Others don’t use Twitter. Everyone has an email address and most of us get notifications on our phones when we get emails. If you give something away, like a free ebook or short stories, on your blog you can grow an email list. I’ve had about 1 person subscribe a day sense I started collecting emails and I haven’t had anyone leave the list yet. I only email my list member when I have free things for them. Like my upcoming ebooks. I don’t need initial sales. I’m going to need initial reviews. No one wants spam. If someone on your email list. You did something right. This is a means of direct communication with your audience. I recommend using WordPress for your blog. It’s an easy platform to use and cheap to upgrade to a dot com when your read for it. I recommend using Facebook and Twitter for your Social Media. Use Crowfire to grow your account and to automate a direct message giving your followers a reason to go to you author site, like a free short story? or book? I recommend using MailChimp for your email list because it’s free and easy to use. If I did a video on how to set all this up would that be helpful? Would anyone want that? Leave comments below and if there’s enough response I’d be happy to make them and walk through the full set up of an author platform if it means helping the industry. I don’t think it would take more than an hour to set up the foundation of the platform. This was very useful, though I have a question. How does Mail Chimp work in relation to having a wordpress blog (I have one, from wordpress.com not .org – I gather there is a difference?) Is it something you have embedded on your site, presumably as a widget? There are a couple ways to do it. I do mine with a link to a mailchimp landing page for sign up (You can vie mine here https://richardklu.com/ ) . If you have a version of wordpress that gives you access to widgets you can use a widget to do it. It’s a little cleaner but not 100% necessary. It saves your visitors 1 click.